A "Politeness Plan"... have I lost my mind? Why yes, yes, I have! I LOOOOOOVVVVVEEEEEE our children! 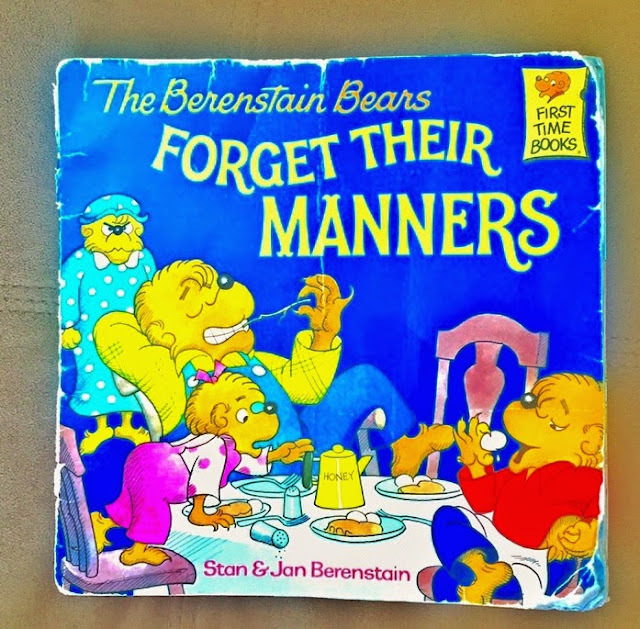 However, I do NOT love they're lack of manners lately. I assume everyone is burnt out on school and is eagerly awaiting summer break (1st gradeitis and junior kindergartenitis... I'm sure those are both a thing, right?). Either way, emotions are high and attitudes are quite hot in this house. 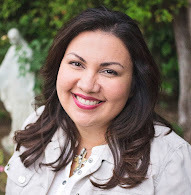 This mama reached her limits a few days ago and was in desperate need of a solution. So I did what every good/angry/panicked that they're kid is going to turn out "bad"/exhausted parent does... I turned to Google and Pinterest. I like to think of Pinterest as my personal "on call doctor" for every aspect of my life. There isn't anything that you can't find on Pinterest! I entered into the search: "How to get your 7 going on 17 year old, Bored 5 year old, Threenager and Tantruming 2 year old how to listen?" Ok, I didn't really type that but I seriously considered it, to better convey to the Internet the specifics of my problem. Naturally THOUSANDS of ideas popped up, none of which I had the time (or energy) to read because, duh... AIN'T NOBODY GOT TIME FOR THAT in the middle of child meltdowns! Just when I felt discouraged I remember a little gem of a book that we had lying around upstairs. 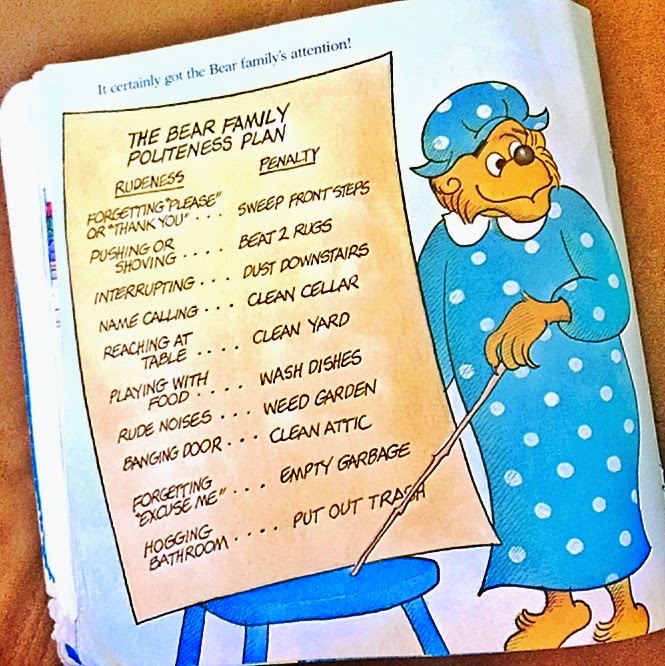 It took a few minutes to find the book in the abyss of toys and dirty clothes (because our children are "allergic" to putting their worn clothes in the laundry shoot. It's a serious condition). Anyway, after a little digging, my daughter finally found the book. Yeah that's right, mama pulled out the BIG guns! "Mama didn't like what was happening to her family. Not one bit. Something had to be done. But what? The best way to fight bad habits, she thought, is with good habits. Then she thought of a plan. She got a big piece of cardboard and a marker. At the top she wrote: THE BEAR FAMILY POLITENESS PLAN." **I would like to pause here to give my own mother a shout out. This is not the first time I have heard of this idea. She has suggested it on more than one occasion and knows that it works. Why? Ohhh maybe because she knows a thing or two about raising 4 kids since she has done it! What can I say? I'm stubborn and also very lazy. Love you, mom! 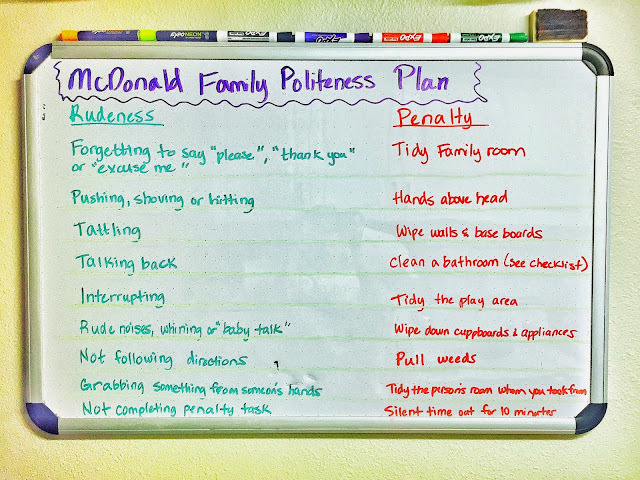 I posted our "McDonald Family Politeness Plan" on our almost never used white board (because we're also unorganized) that hangs in our laundry room. Never mind how long it took me to write and re-write this list to make it legible. Also never mind my spelling errors, which I have yet to fix. I really should go do that. 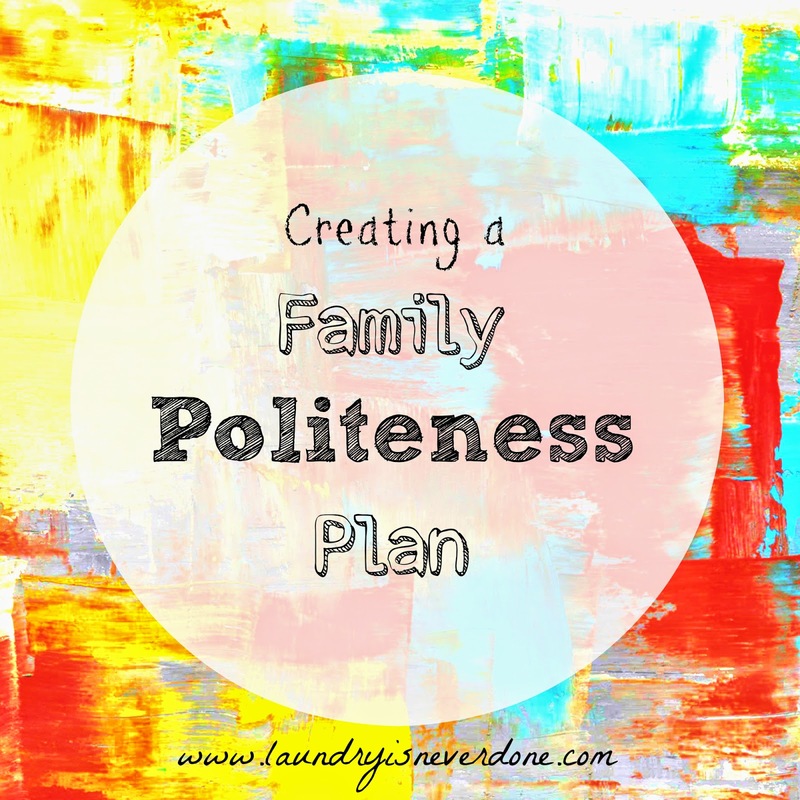 So far our Family Politeness Plan is proving to be a win-win for all! Lol. Interesting idea. I tried something similar by creating a list of house rules, although I am still struggling with consistency. I'd be curious to hear an update from you in a month or two with any tweaks you needed to make or any additional tips you have. Bravo! 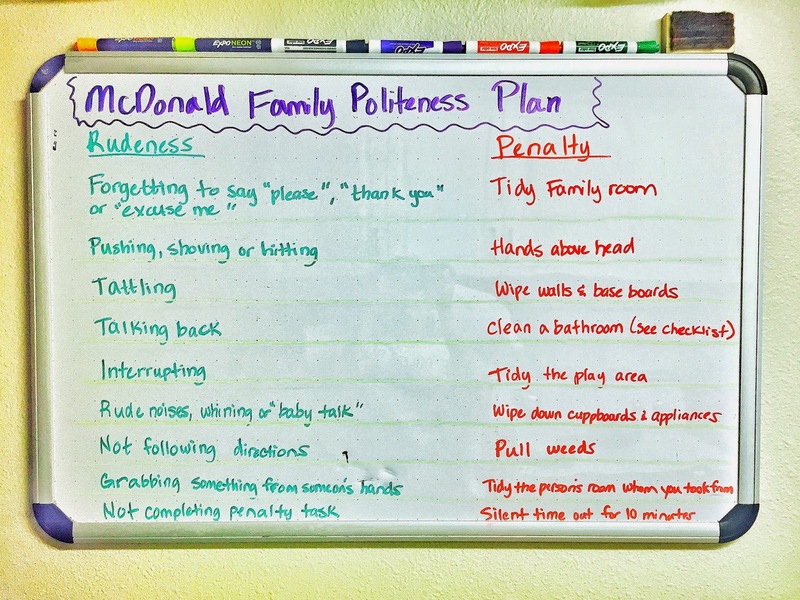 I wish more parents would implement things like this because after a certain point, time outs and shouting just aren't as effective. Consistency is definitely the biggest challenge but I love that you're already seeing improvement both in the kids' behavior and in their sense of responsibility and accomplishment. A few of them are having A LOT of trouble breaking some habits. We are at he point where I don't have to remind them all the time. 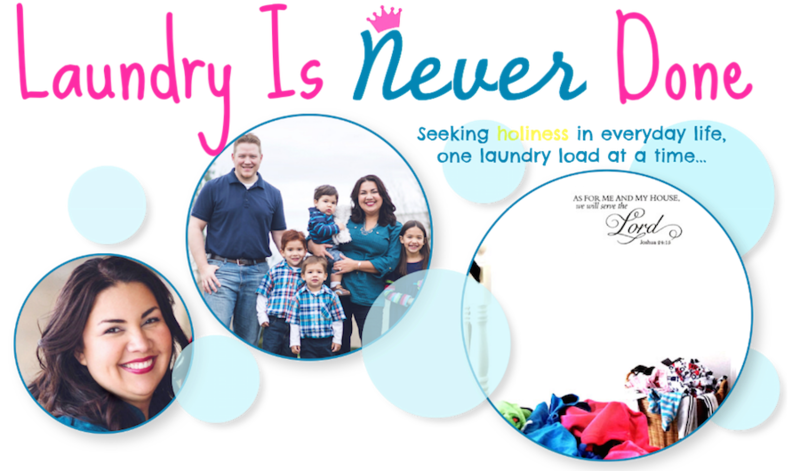 They just hang their head in shame as they walk down the hall to grab a rag in the laundry room to start scrubbing. LOL! !